A new patent by Microsoft has been found that suggests the company is working on making its HoloLens 2 augmented reality headset both less bulky and more affordable. This is encouraging news, as two of the biggest criticisms levelled at the original HoloLens was its chunky design and its incredibly high price. The new patent, titled 'Compact Optical System with Mems Scanners for Image Generation and Object Tracking' (catchy, isn’t it? ), suggests that Microsoft will use one light generation system to create holograms, while also being used for sensing depth and recognising gestures. 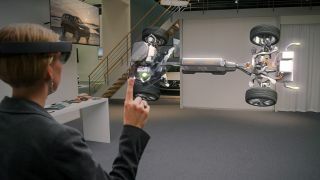 By using one part, instead of multiple dedicated parts, Microsoft aims to make the HoloLens 2 less heavy and uncomfortable to wear, while also reducing the cost of manufacturing the device, which should also lead to the HoloLens 2 being less expensive to buy. NED stands for Near-Eye-Display, which the HoloLens 2 will be classed as. A cheaper and lighter HoloLens 2 will definitely be a welcome move, and could make the device more attractive for consumers. The original HoloLens was mainly used by businesses due to the high price of the device. We’ve already heard that the Microsoft HoloLens 2 is likely to be more powerful than Google’s AR headset, and if Microsoft can fix the original HoloLen’s other major issue – a very limited field of view – then the HoloLens 2 could end up a very exciting product.